Munnar's sprawling tea plantations, pristine valleys and mountains and cool air have long been a favourite with both Indian honeymooners and foreign tourists. In recent years, this beautiful landscaped hill station has been attracting adventure travellers, who are enamoured by the area's stunning topography, which is ideal for paragliding, trekking and rock climbing. Also known as the Kashmir of South India, it is a peaceful hill station with its impeccable beauty. Munnar was the erstwhile 'Summer Capital' of the British Government in South India. It is the luxuriant gift of nature to the Western Ghats, the eastern border of Kerala and an adjoining parts of Tamilnadu. The very name 'Munnar' means three rivers and there are actually three of them, confluence of three mountain streams-Mudrapuzha, Nallathanni and Kundala 5000ft above sea level. 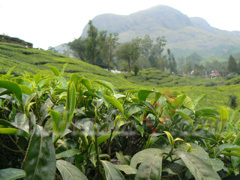 Munnar consists of vast sloping areas of tea, most of which mostly are owned by Tata Tea. Coffee and cardamom plantations give it a simplistic and smooth appearance. 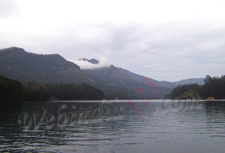 Munnar is a perennial favourite of Indian honeymooners. Dense forests, wildlife sanctuaries and major cash crop plantations cover most of the region. Among the exotic flora found in the forests and grasslands here is the Neelakurinji. At that time, the hill side will appear bluish in colour. This flower bathes the hills in blue once every twelve years, will bloom next in 2006AD. Munnar also has the highest peak in South India-Anamudi, which towers over 2695m. Anamudi is an ideal spot for trekking. Munnar abounds in animals like elephants and Nilgiri langurs. Traditions of the British Tea Plantation town are still preserved in this heavenly and un-spoilt hill station. This small hill station with its velvet lawns, exotic flora and fauna and the cool mountain air . It is a beautiful place with lot of tea plantations. The Sta Devi Lake with its mineral waters and picturesque surroundings is a good picnic spot. The lake is also ideal for trout fishing. Driving through the Kodaikanal Rd, Mauttupetty just 13km from Munnar situated at a height of 1700m. Mattupetty is known for its highly specialised dairy farm. -The Indo Livestock Project. Over 100 varieties of high yielding cattle can be seen here. Mattupetty has a beautiful rose garden. Visitors are allowed into three of the 11 cattle sheds at the farm. Visit time 9 to 11 hrs and 1400-1530hrs. The Mattupetty lake and dam is just a shot distance from the farm, is a very beautiful picnic sport. The sprawling tea plantations and the Kundala lake are other attractions in the vicinity. DTPC Idukki provides boating facilities in the Mattupetty dam. Speed launch, slow speed boat and motor boats are available for hire. The famous Eco point is very near and this scenic place gets its name from the natural echo phenomenon here. Located beween Munnar and Rajamala, Nyayamakad is a land of scintillating waterfalls. The waters cascade down a hill from a height of about 1600 meters. The enchanting surroundings makes an excellent picnic spot and ideal trekking point. A small village with sleepy little cottages, bungalows, old playgrounds and courts. Chithiripuram still reminds us of an old world charm. Home of the Pallyvasal hydel power project, this hill town is also famous for its picturesque tea plantations. Eravikulam National Park lures the travellers with its irresistible grace and beauty. The 97 sq km park is situated in the Devikulam Taluk is a home to the Nilgiri Tahr, Nilgiri Langur, sambar and the Lion-tailed Macaque. click here to know more .